Hrs: 0700Z MON-0600Z SAT; EXCP HOLS, OTR TIMES BY NOTAM. APCH/DEP SVC PROVIDED BY ALBUQUERQUE ARTCC FREQ 134.45 (TUCSON RCAG) AND FREQ 327.15 (TUCSON RCAG) WHEN LIBBY APCH CLOSED. BASE OPS OPR MON 0700Z-SAT 0600Z, EXC HOL, OT 72 HR PPR. DSN 879-2860/2862, C520-538-2860/2862. A11 APRON, TRML & NE END OWNED BY CITY OF SIERRA VISTA. A110-11 WHEN CLASS D AIRSPACE IN EFFECT UNMANNED AERIAL VEHICLES OPER SFC TO 7000 FT MSL. A110-14 USAF WX FCST AVBL 0500-2000 FROM DAVIS MONTHAN AFB. A110-16 TWY G AND TWY J LTD TO SW ACFT MAX 33,000 LBS; TWY K LTD TO SW ACFT MAX 50,000 LBS; TWY D AND ACFT APRON ON NW SIDE LTD TO DW ACFT MAX 100,000 LBS. A110-17 CIRCLING NOT AUTHORIZED SOUTH OF RYS 8 AND 30. A110-18 JOINT-USE CIVIL-MILITARY ARPT; EXTENSIVE MILITARY JET OPNS WEEKDAYS. BIRD HAZARD VCNTY ALL RYS ON TKOFS & APCHS. DEER ON & INVOF ALL RYS & TWYS ESPECIALLY AT NIGHT. A110-2 CIVILIAN ACFT PPR TO ENTER MILITARY RAMP. A110-21 TRAN ALERT - TRAN ACFT, CTC LIBBY ATC OR BASE OPS TO COORD PRK. A110-28 CSTMS/AG/IMG: AVBL WITH 72 HR PN FOR US MIL OR DOD CONTRACT ACFT ONLY. A110-29 MISC: ALL TRAN AND RON ACFT USING MIL SIDE MUST SIGN IN AT BASE OPS PRIOR TO DEP FLT LINE. 72 HR PPR FOR USE OF ASSAULT STRIP LCTD 5 NM NE. NON-SKED ARR ACFT REQ ASSISTANCE, CTC EOC 533-2291. A110-3 ALL ACFT USING MILITARY TSNT PARKING SIGN IN AT BASE OPNS PRIOR TO LEAVING FLT LINE. A110-30 MILITARY USE: OPR 0700-0600Z MON-FRI, EXC HOL, OT 72 HR PPR DSN 879-2860/2862, C520-538-2860/2862. SEE FLIP AP/1 SUPPLEMENTARY ARPT RMK. A110-31 RADAR: SEE TERMINAL FLIP FOR RADAR MINIMA. A110-32 MISC: WX OBSN/FCST 0700-0600Z MON-FRI, EXC HOL. ASOS OT. LIBBY WX AVBL ON 122.95 DSN 879-3798/2865. C520-538-3798/2865. A110-33 RSTD: 24 HR PPR FOR ALL TRAN MILITARY ACFT. CIV ACFT PPR TO ENTER MIL RAMP. A110-34 CAUTION: EXP WIND SHEAR ON APCH TO ALL RWY; ARPT SW WIND MAY NOT BE REPRESENTATIVE OF WIND ON FINAL APCH. EXTV MIL JET OPR WKDAYS. A110-35 MISC: REMOTE BRIEFING SVC AVBL 25 OWS DAVIS-MONTHAN AFB DSN 228-6598/6599/6588, C520-228-6598/6599/6588, AND C1-877-451-8367 EXTN 1, OR HTTPS://25OWS.DM.AF.MIL. A110-36 MISC: A - LIBBY BASE OPS OPR 0700-0600Z MON-FRI, EXC HOL, OT 72 HR PPR. DSN 879-2860/2862, C520-538-2860/2862. A110-38 RSTD: TWY G LTD TO S33, TWY K LTD TO S50; CIR NOT AUTH S OF RWY 08 AND 30. A110-39 AIRSPACE CDSA LTD TO DEPS & FULL STOP LDGS ONLY DURING NIGHTTIME UNMANNED ACFT OPS. EXPECT POSSIBLE DELAYS. MANNED & UNMANNED ACFT NOT AUTHORIZED IN THE SAME TFC PAT. ARRIVING MANNED ACFT MAY FOLLOW UNMANNED ACFT ON FINAL. 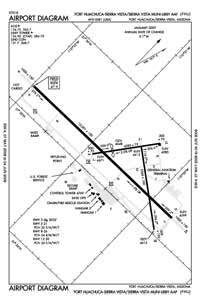 A110-40 CIVIL TRAFFIC PATTERN NOT AVAILABLE DURING DAYTIME UNMANNED AIRCRAFT TRAFFIC PATTERN OPERATIONS. DEPARTURES AND FULL STOP LANDING AUTHORIZED. A110-41 TPA: FIXED WING UNMANNED AIRCRAFT 5700(981). A110-42 TPA: DO NOT EXCEED 5700 FT UNTIL DEP END OF RWY. A110-43 RWY 8, PAR NOT COINCIDENT WITH PAPI DUE TO TCH DIFF OF GREATER THAN 3 FT. PAR TCH: 41.0 FT / PAPI TCH: 50.3 FT. RWY 26, PAR NOT COINCIDENT WITH PAPI DUE TO TCH DIFF OF GREATER THAN 3 FT. PAR TCH: 49.8 FT / PAPI TCH: 80.3 FT.
A110-5 EXPECT WINDSHEAR ON APCH TO ALL RWYS. A110-6 TFC PAT: FIXED WING ACFT NORTH; ROTARY WING SOUTH TFC PAT; ALT FIXED WING RECIPROCATING 5700 FT; ROTOR WING 5500 FT; FIXED WING TURBOPROP/JET 6200 FT.
A13 COPY OF JOINT USE AGREEMENT WITH US ARMY CAN BE OBTAINED FM-DIST ENGR, US ARMY ENGR DIST, BOX 2711, LOS ANGELES, CA 90053. A16 LIBBY ARMY AIRFIELD ADDNL PHONE NUMBERS: 520-538-2860/2861/2862. CAROLYN TOMPSON -BASE OPS MGR - 520-538-2861. A81-APT ACTVT PAPI RWY 08, 26, 12 & 30; HIRL RWY 08/26; MIRL RWY 03/21 & 12/30; PERIMETER LGT H1 - CTAF. E100 FOR EMERGENCY 121.5 MONITORED WHEN ATCT CLSD. E111 PER JOINT USE AGREEMENT. Dual Dual Tandem Wheel Landing Gear: 700. Dual Wheel Landing Gear: 106. Dual Dual Tandem Wheel Landing Gear: 172.